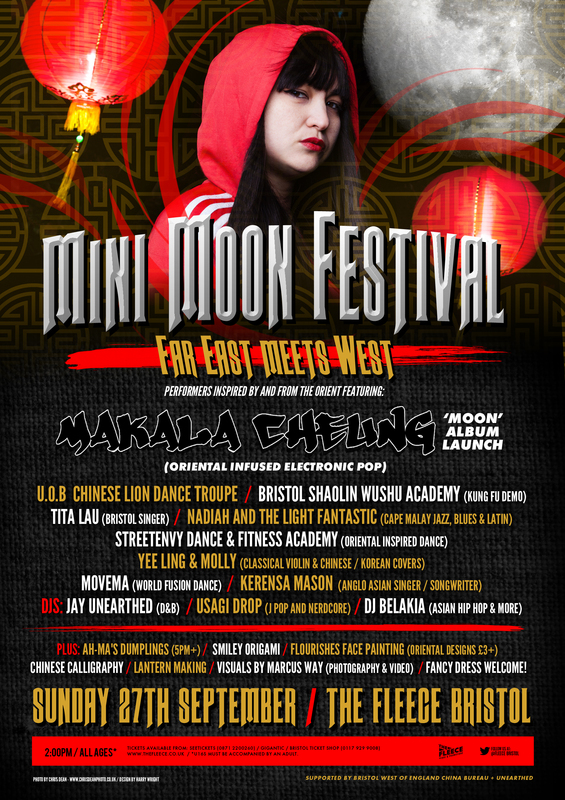 Makala’s music and videos have featured on Bristol’s Big Screen at Millennium Square for the last two years during Harbourside Festival (pictured below). In 2015 Makala’s work was exhibited at The Island as part of When Death Comes, which included poetry, lyrics, music and even music videos all responding to the topic of loss. The lyric design was in collaboration with Bart Designs, and videos with Marcus Way. Makala also performed a special more traditional acoustic version of her music at the exhibition event. (see the video on the performances page). Musical influences include Banks, FKA Twigs, M.I.A, Aaliyah, Dizzee Rascal, Lauryn Hill, Katy B. She’s been compared to Kate Bush, Madonna, and Bjork. Her uncle Chow Chong, was known in Hong Kong as the Father of Cantonese Pop, as he released the first Chinese song in Cantonese (rather than the much more widely spoken Mandarin).